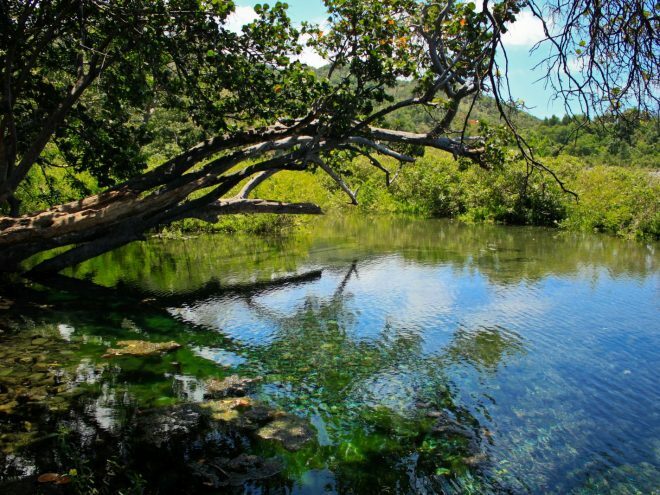 We Cubans may be fortunate enough to live on an island with gorgeous sandy beaches and turquoise seas that can put any other such scenery to shame, but many of us prefer to swim in fresh waters, particularly in rivers. We take daytrips inland just for that reason, or camp out for several days. Another option is taking advantage of the numerous campismo sites which have set up simple cabins and facilities close to the most important Cuban rivers. Imagine fresh clean streams, surrounded by wonderful natural scenery often backed up by mountains and valleys and overrun with lush vegetation taking in a wide variety of species of plants. Endemic fauna inhabits these areas to complete the picture greeting all visitors. We have chosen a few specific locations on the Island which will beautifully illustrate these vacation spots. Many of them are quite close to our cities yet they seem to have an unending capacity to surprise us with their existence and they clearly are a vital contribution to the Cuban identity. One of these places is the Canímar River in the province of Matanzas. It flows out into the sea through a steep shoreline, something like a canyon. In its vicinity are sites rich in legends and archeological finds. Río Canímar Tourist Park is one of the most comfortable facilities of its kind in the entire country, just 27 kilometers from Varadero Beach. One of its attractions is a boat trip down the river, surrounded by hills. It is a rugged trip with no shortage of unexpected twists and turns, allowing visitors to communicate with nature. Thousands of years ago this spot was a veritable paradise for the natives, providing fresh water, abundant hunting and fishing including many species of fish and shellfish. Nowadays, its geography presents us with majestic reminders of that past. When you spend some days here, not only can you feel like you are travelling back to that past but you are guaranteed a very relaxing time. Far from Canímar, in the eastern part of Cuba, the La Mula River in Santiago de Cuba Province has the distinction of flowing down to the sea from the highest mountains in Cuba, the Sierra Maestra. Some years ago, a campismo popular facility was built to provide accommodations for the thousands of people who like to visit every year. The experience is certainly one that is not too common in our modern world. At the Campismo Río La Mula facility you can enjoy swimming in the ocean if you like because it is located right at the spot where the river flows into the sea, part of the lovely eastern coast of Cuba. If you are in an ecological frame of mind you can enjoy swimming in the water holes in the river that form natural pools, protected from the sun by a canopy of leafy vegetation. Other visitors are delighted by the prospect of hiking in the hills to reach the Poza Los Morones or, on the southern slope ascending to Cuba’s highest peak, Pico Turquino. While we are in the far eastern end of the Island we can also visit the city of Baracoa, the first town to be founded by the Spanish when they were colonizing Cuba. Only 10 kilometers from that city lies the campismo base called El Yunque, on one of the shores of the Duaba River that flows through this area, right at the highest point of Baracoa’s massif. The name is due to how much the outcropping resembles a metalworker’s anvil (yunque). Anywhere you roam in this area, the sound of the rippling Duaba River currents will be your accompanying soundtrack. A natural lookout gives you the chance to observe the full extent of the landscape of mountains and rivers, the Atlantic Ocean and Puerto Santo Bay where Admiral Christopher Columbus landed on his first journey to the New World. For the more adventurous travellers, there are spots where you can pitch your own tent, set up your campsite and at the same time enjoy the site’s recreational facilities, such as an audio/video rec room, horseback riding and a dance floor. El Yunque is the ideal base from which you can also take excursions to the waterfalls or to the top of El Yunque in the company of experienced guides to learn about one of the most picturesque sites having the greatest biodiversity and the most endemic species in the area. This is the Alejandro de Humboldt National Park, a protected area that was declared a UNESCO World Heritage Site. These are just three of the many rivers flowing through our Island. Their charms have captivated vacationers for years and are certainly worth exploring. What you get are many memorable experiences and the desire to go back again and again.